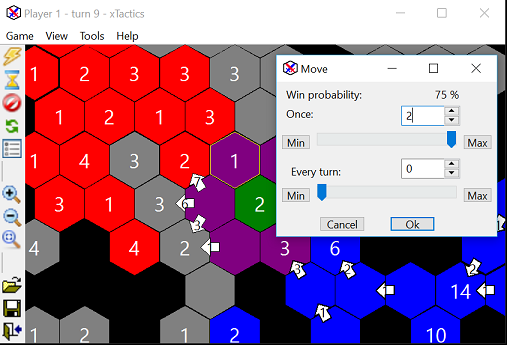 A turn-based strategy game inspired by classic Risk board game. The game is highly configurable to allow to adjust battle field and various game rules. Map can be generated in cyclic mode to simulate world without borders. Application configuration stored in XML file. Allows to save and load game to game file in XML format with extension .xtg. Multiple map cell shapes as hexagons, squares, triangles, isometric, and random mesh. Bridges between remote cells visible as lines. Multiple players support. Players can have different color and other starting properties. Application automatically open saved game file given as command line parameter after execution. Computer player settings to be low, medium or highly aggressive in attacking. Use Shift key during mouse click to attack maximum available power is moved without dialog confirmation. Use Control key during mouse click to move with maximum one time and repeated unit counts to selected target cell. 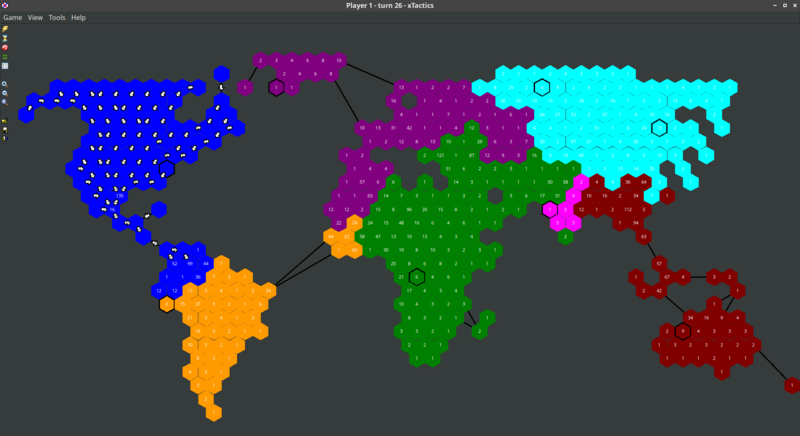 Game option "Fog of war" which cause map to be covered to black and only explored cells will be visible. Auto save game to file option in settings. Map shape can be selected as Rectangular, Rounded or mask from image file. Support for symmetric map usable for two players game. Confirmation dialog for ending game. Support for switching large icons in toolbar. Support for cities. Cities can configured to be used as only growing cells. Allows to set grow rate as square root of cell power. Amount of inaccessible cells can be adjusted in New game dialog. Player mode human or computer. Graph window can be shown from menu which presents development of various statistic values during game turns. Load recent menu action to load recently opened/saved files. xTactics.png​ (64.4 KB) - added by chronos 2 years ago. xTactics world.png​ (102.8 KB) - added by chronos 17 months ago.